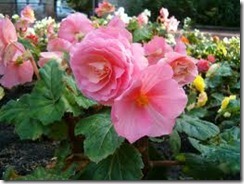 Begonias are hardy tuberous plants that can provide your garden with years of colorful flowers. Each year, you should remove the tubers from the ground before the first frost, allow them to dry out and store them in a cool, dry place until the following planting season. When the chance of frost has past, it is time to plant the begonia tubers in the ground. Choose a location with good drainage and partial shade in areas where summers are hot and in full sunlight in areas where summers are cooler. 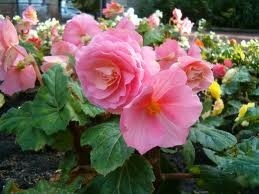 Begonias need to be in ground that is moist, but not consistently wet. Add equal parts of compost or peat moss to equal amounts of soil if the soil has a tendency to be wet for long periods. Loosen the soil, add the organic material and work it deep into the soil about 6 inches. Place the begonia tuber in the loose soil with the indented side facing up. This is the side of the tuber that sprouts. Tubers should be in the soil with the top of the tuber level with the ground. Do not cover the tuber with soil after planting. Plant the begonia tubers 8 to 12 inches apart in a garden. In a container, plant tubers 3 to 5 inches apart. Soak the soil around the begonia tubers. Keep the soil moist, but not wet, during the growing season.